After the Korean War. Korea depended completely upon military vehicle aid from the United States, notably the M48 Patton Tank developed inn 1952, which received some upgrades. By the 1980’s Korea was starting to produce its own military vehicles, the most significant was their K1 Main Battle Tank. 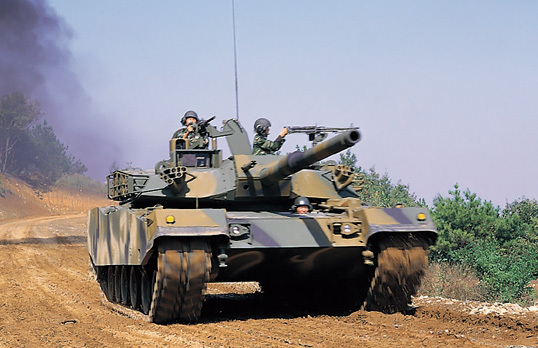 The K1 aka 88 tank, was manufactured in South Korea by Hyundai ROTEM. The K1 was designed by Chrysler Defence, now part of General Dynamics Land Systems, who started development in the early 80’s and by 1983 had built two prototypes under the designation XK-1. The two prototypes were given reliability testing through to 1984. The K! tank is nick named “the baby Abrams” due to its close design being similar to the American M1 Abrams, also manufactured & designed by former Chrysler Defence. 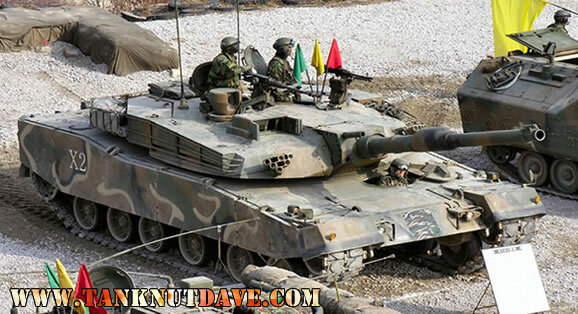 The designation of this tank is some times called the Type-88 in honor of the 1988 Seoul summer Olympic Games. The K1 and the K1A1 battle tanks have been given the nickname of “Monster Tank” by Northern Korean soldiers, who fear it, as it out guns their main MBT, the T-62 and have been unable to produce an MBT that could offer a serious threat to the K1. K1 Production began in 1984. By 1987 210 K1’s had been built and another order was made for a further 325 K1’s. By 1999 just over 1000 K1’s had been built. 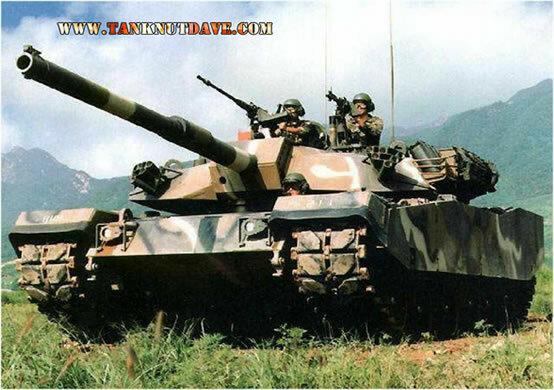 Its 105mm main gun is the American designed M68A1 (developed from the highly successful British Royal Ordnance L7) and license-produced in South Korea. In 1996 two prototypes of the K1-A1 were built and successfully passed field-testing, with improvements to the main cannon, sights and other technical equipment. The K1A1 is the upgraded version of the K1 and has been in production since April 1996. Its most significant change is the main gun. The 105mm has been replaced with the larger M256 120mm smoothbore (the US licensed product of German Rheinmetall L44 120mm), which is also used by the American M1a1 & M1A2 Abrams. It also has upgraded sights and a new 32-bit ballistic computer, as well as upgrades to the engine. Its also had changes in its shape and surfaces now being more curved as well as the installation of the same type of depleted uranium plating inserts as used in the American Abrams. The weight of the vehicle has increased from the K1’s original 51.1 tons to 53.2 tons for the K1A1. The four-man crew is protected by the British designed Chobham type armour, built in America. The diesel engine is the German turbo-charged MTU MB 871 Ka-501, which produces 1200hp and gives the K1 a top road speed of 65km/h with an operational range of 457km and is built under licence in South Korea by Ssangyong Heavy Industries. The tank commander has a French SFIM two-axis, independently stabilised, panoramic sight(with magnifications of x 3 and x 10), manufactured by Samsung Electronics Company Limited, under licence from SFIM. The tank has a 7.62mm M60E2-1 coaxial mounted machine gun, while the loader operates a hatch mounted 7.62mm M60D and the commander operates a 12.7mm K6 machine gun mounted on his hatch. The K1 also has two forward mounted smoke grenade launchers on the turret. The K1 is also equipped with a Halon fire extinguishing system, which thanks to its internal infrared sensors, will automatically extinguish a fire in the crew compartment within 0.025 of a second! It is also equipped with a modern NBC system. The track and suspension system for the K1 is very unusual. During the 1950 to 1953 Korean War, when the communist North invaded the South by crossing over the UN 38th Parallel line, a lot of tank warfare was conducted along the vast hill and valley sides, which demonstrated the need for tanks operating in Korea, to have greater hill climbing skills (the British Churchill tank proved to be superior at this) and to be able to adjust their cannon elevations to a greater depression, which most Western tanks of the time had not needed whilst fighting in the open plains of Europe and Africa during WW2. The K1’s suspension system allows the driver to adjust the height of each of the road wheels, which allows the vehicle to have three general positions. The ‘standing’ position raises the hull, to give better handling over rough terrain and allows the K1 to climb up hill slopes up to 60 degrees, which hardly any other MBT can do. By lowering the hull into the ‘sitting’ position, the profile is lowered and gives far better road control. The K1 is also fitted with rubber tracks to prevent damage to public roads (as was the British Chieftain in West Germany during the Cold War) as the K1 also operates in town/cities during the countries many civil war drills, in preparation of another invasion by North Korea. The ‘kneeling’ position is were the front wheel’s are raised and the rear lowered, so that the K1 has a higher cannon elevation and able to fire up hills/mountains or the rear wheel’s raised and the front lowered to create a greater cannon depression and can fire down hills/mountains. In 2007, the Joint Chiefs of Staff (JCS), the Army and the developer of the tank, Hyundai Rotem, consulted one another about the requirements for the K1 & K1A1 tank upgrades. Several upgrade items were decided on at that time with a focus on equipping the tank with the C4I network-centric battlefield management systems as used on the K2 Black Panther Tank. Other improvements will include an identification friend or foe (IFF) system that fires a Ka band beam for a response from the target. If a proper response signal is shown by the target, the fire control system automatically identifies it as friendly. Otherwise, it is declared as hostile. Hyundai has already invested in developing an air conditioning system for the K1A1, without budget support from the military. “We’re developing an air conditioning system for the K1A1 and hope that the JCS and DAPA will review the plan positively in terms of the welfare of soldiers as well as the tank’s future exports,” a Hyundai official said, requesting to remain anonymous. New disignation of the upgraded K1 Tank. Deliveries to the ROKA started in 2014. Manufacturers website says the following upgrades added: Digital battlefield management systems, IFF equipment, surveillance cameras front and rear. New disignation of the upgraded K1A1 Tank. Deliveries to the ROKA started in 2014. Manufacturers website says the following upgrades added: Digital battlefield management systems, IFF equipment, surveillance cameras front and rear. The manufacturer does not state if air-conditioning has been added. The upgrades should extend the vehicles service life and serve along the new K2 Black Panther tank, which has now entered service.